Why this project takes place? Europe get questioned every day. Following symptoms in Europe can be recognized: decline in turnout and other forms of political participation, policy making that is increasingly detached from ordinary citizens and their preference, as well as erosion of trust in government and satisfaction with democracy among citizens. 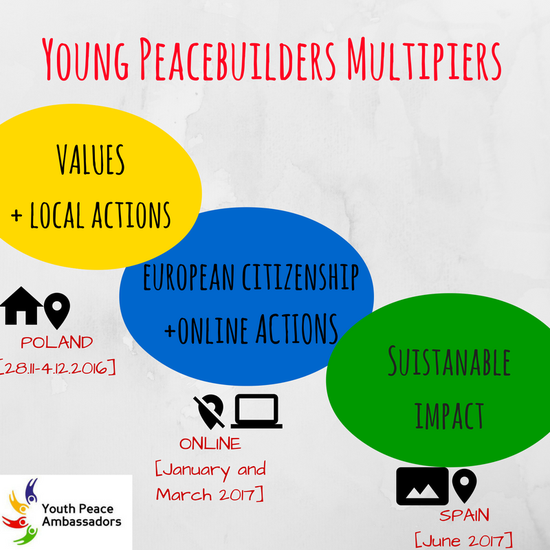 With the project Youth Peacebuilders Multipliers (YPbM) we are aiming to empower young people to play a stronger role in advocating and educating for democracy and active citizenship both on a local and on an European level. We would like to show that democracy is about far more than just voting and encourage young people to take an active role in their communities and in a common Europe. The aim of the project is to equip 27 youth activists with competences to be actors and multipliers of building and sustaining strong democratic systems across Europe. 1. group of 27 trained youth activists-multipliers who will be able to act locally, support each other through online tools and promote the values of democracy and human rights. The participants will not only be able to act, but will be expected also to multiply their knowladge by getting active within their local communities and passing on their knowladge. 2. development of a set of innovative practices which will be also implemented by the participants in their local communities. 3. creation of the intellectual output – Online platform of Young Peacebuilders Multipliers. The platform will be a combination of a regular website and several new media tools. to ensure sustainable impact and a high level of youth participation in European democracies. The project consist of THREE MAIN PHASES exploring different topics and developing certain skills of the participants. The different phases will include e-learning, mentoring, two residential seminars and two online weekends. In between the different phases participants are expected to realize a local project and online international action. Throughout the project we will explore democratic values and different tools how to include those values in projects and in our everyday life. Participants will be able to follow four different tracks (art, education, activism and policy making) getting a deeper understanding by focusing on a specifc set of tools to act for democracy. The participants will explore the concepts of human rights, culture of peace and democracy. They will focus on analyzing their local context (including existing policies and spotting stakeholders), and identifying how democracy function in their community. Through the specific tracks participants will get equiped with different tools that they will be able to use after the seminar in their practice project. This phase include two online weekends where participants will work on the topics of European Citizenship and online activism bringing the discussion of democracy from a local perspective to a European one. While giving a special attention to solidarity and the links between the different communities, participants will explore possible options and tools to act together using social media tools. Participants will set up different online actions that will be realized before the third phase of the project. At the last phase while consolidating the learning of the previous year participants will focus on how their work and their commitment can be sustainable. The activities will explore one hand sustainabiliy on a project level as well ways such as social bussineses, sturt-ups, enterprenourship and different funding oportunities to include the work for our values and strengtening democracy in our everyday life. During the entire project an online journal will be created not only to track the learning process, but to make it accessible to other youth workers and young people willing to work for democracy. The journal will include on one hand a toolkit with all the activities used during the program, an overview on democracy from the participating communities and on an other hand will also share the projects of participants and their difficulties. be available to take part in all the phases of the project (offline meeting in Poland 28.11.-4.12.2016, offline meeting in Spain in June 2017, online meetings on 1 weekend in March and January 2017, local actions, online tasks). After offline meetings participants will organize local action realized within their organization. After online meetings will be expected to organize an on-line actions at the international level. During the whole project the role of young people in strenghtening democracy will be emphasized with a special focus on their role as multipliers .While dealing with the special topics and tools in the different phases of the project, partcipants will also get training on how to act as facilitators in educational activities. Esta publicación (comunicación) es responsabilidad exclusiva de sus autores. La Comisión no es responsable del uso que pueda hacerse de la información aquí difundida.